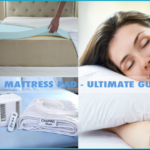 Buying a mattress topper requires your understanding and complete knowledge regarding what a mattress topper actually is, and how it can benefit you to obtain added comfort, while sleeping. It is not as easy and simple as it seems to be and you should be very careful in picking up the most suitable option for your use. The issue becomes even more sensitive and attention demanding when you have got to buy or have planned to purchase a memory foam mattress topper. A memory foam is definitely far better as compared to the traditional foam mattress topper made of polyurethane. The memory foam gel offers, support, comfort and a unique therapeutic advantage for those with, joints and muscle problems. It has the capability to memorize your body posture and keep you fit in a best supported posture while sleeping on it. But you cannot just go to the market and pick a mattress topper and it will be the one that you were looking for. It is not the correct way. You will have to find the correct size, thickness and the correct density of a topper that matches your needs and will fulfil your comfort needs at its best. So here is the best way to choose the right thickness and density according to your needs. Definitely a 2 inch thick topper would have the least in its thickness and merely provides a little added comfort and features of having a memory gel on your mattress. This one is good for those who own a comfortable mattress already and only need to get softer and supportive feel while asleep. A 3 inch thick or the topper with a medium thickness is most popular mattress topper. It is because the topper has the ability to provide extra soft surface and support to the neck and backbone by contouring according to the body curves. If you need to enjoy extra soft and supportive memory foam features, then you should be opting to get this one. A 4 inches thick mattress topper is one of the luxurious toppers choice and has the ability to provide you all the benefits of a high quality memory foam mattress. This one can completely adjust according to the body shape and weight and would lift up the body parts that need support. You can choose the thickness according to the desired level of comfort you need. The density of a memory foam determines the extent to which you will be getting the comfort, support and warmth and also the softness of the topper. These memory foam mattress toppers that have a density of about 3 lbs per cubic feet have been considered as the least dense and are very soft. It means that the memory foam weighs about 3 pounds per cubic feet. Such a topper will have a lesser dense memory gel and will be light in weight and also will melt down quickly with the temperature of the body and would take less time to readjust to its actual posture. So if you just need to have a lightweight, quick setting memory foam that only has the ability to provide added softness and not necessarily supporting the body, then you can surely buy this for you. 4 or 5 pounds per cubic feet is the best density for a memory foam. As it will give a medium weight and a slightly firmer option for you to enjoy. This density makes the topper capable to provide supportive function as well as extra softness. The toppers having this density melts according to your body a little later and can keep the contours in shape for longer periods of time. If you need to make sure that your topper is able to provide a little bit of support and but still need a softer version. Then it is your best shot. For topper that have the density of about 6 pounds and above mean they have the highest quality memory foam gel that can support and keep the body in its best form for a long time. This also has the ability to keep the posture for a longer period of time. A high density memory foam is also heavier and is stiffer, also it takes a long time to melt and it takes a long time to conform to the body posture. It will also require a longer time to get back to its original shape and form. Such a density is perfect for therapeutic purposes and would be best to support in severe medical conditions like arthritis and joint pain. These toppers are best to be used when you need to lower the painful experience of having pressure points. But it would not be suitable for you to buy, if you have no therapeutic purpose to fulfil or need a soft topper. All these aspects are very important in determining the exact quality and features of a memory foam mattress topper, and you should be well aware of the best possible solution for your mattress topper needs. This website was amazing. It is worth the time to read every bit of the informaion in order to prepare yourself to purchase the proper topper. I need a full size 4″ 5 density topper with rounded corners if possible . My boyfriend and I are very small built. We have a 12inch memory foam mattress that is to hard. I need something a little softer and give lower back support. We are Both side sleepers. I can’t decide if the 2in memory foam topper Will be better then the 3in. I can’t say for sure 2 inches or 3 inches is better, it’s too general to compare without any specific topper. 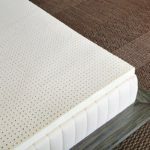 For side sleepers, we have collected top rated mattress toppers in this article: Best Mattress Topper for Side Sleepers. 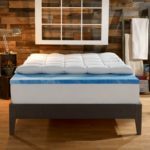 There are some great toppers for side sleepers with good back support, you should check out that article to find the right topper. I want a topper thaaat is firm and well ventilated. I dont do soft mattresses. Suggestions? 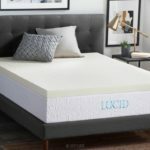 You can check out this product https://www.amazon.com/LUCID-Ventilated-Memory-Mattress-Topper/dp/B0099X7264/ or this article https://www.thebestmattresstopper.com/firm-mattress-topper.html to see if you can find something there. I have neck and back pain from spinal disk injury from an auto accident. want to have my car’s driver seat reupholstered with 3-4″ memory foam. Any suggestions? 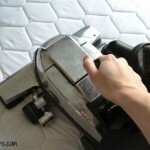 Please check out this article Best mattress topper for back pain to see if you can find anything useful there. I have chronic lower back pain and have been researching like crazy for a topper. I had an injured right arm( rotator cuff) for months till present for sleeping bad on my side. I bought a bed that I thought was firm enough but wrong choice, pain everyday as it is a pillowtop( Eastmanhouse Seabreeze pillowtop) and too soft. I went researching and bought Martha Stewart dream Science 3″ adjustable memory foam . It didn’t work out .Got flat and no support. I realize that I need very firm but cushiony a little because Im a side sleeper most of the time. I though that the Snuggle Pedic 4 Lbs / 5Lbs density would be perfect but the fact that it was only 2 inches puzzled me . I have learnt that the more inches , the thicker the density so this is conflicting. My bed is already soft so I need very firm support to create a balance. Please can you suggest something appropriate .8 I’m in desperation to sleep without pain. My 90-year-old dad has severe arthritis in his hips as well as a tumor on his kidney. He likes a firm mattress. He has a hard time turning at night. The doctor suggests a memory foam mattress topper. Could you recommend a good firm one for me? THANK YOU! What about a person’s height and weight in determining which topper to buy. I am 70 years old; 5’11” tall and weight 275 lbs. Which topper is best for me. Also I am a side sleeper predominately. Please advise. Generally, a heavier person should choose a thicker, denser topper. If you are light you can go with any density. But if you are heavier (in the over 250 Lb category) you should choose high-density topper (should be 4+). I have been advised by a representative at a memory foam topper manufacturer that a 3 inch topper with exactly the same density as a 4 inch topper would feel no different comfort/supportwise. Would you say this is correct? 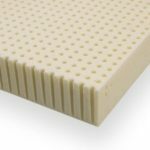 Generally, 3 inch and 4 inch toppers will provide different comfort to your mattress. But the difference varies for specific mattress toppers. I was wondering the same thing. 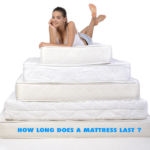 If a memory foam mattress topper has the same density, does the thickness of it matter? I had a 4″ inch thick memory foam topper & have been looking at 3″ inch thick ones. The ones in my price range that I have been looking at have the same density but just 1″ less thick. So was wondering if they would have the same feel? You and I seem to have very similar ailments (unfortunately!). I have also been looking ay getting a memory topper, mainly for my hips at the moment, but also have shoulder and neck pain. Did you end up buying one? Are you happy with it ?. I hope for your sake you did, and are enjoying a pain free sleep. I can’t wait for that, fingers crossed.